Active since the 1920s, the RCHS has worked for decades to protect and present theheritage of Randolph County. They have published a number of local history books,including "Historic Beverly, a Guidebook" by Donald Rice and Phyllis Baxter, and"Randolph 200" by Donald Rice, both available from the Society. They own and operate the Randolph County Museumin Beverly, and is a partner in the Beverly FamilyHistory Research Library. Two other RCHS projects stand behind the Museum. The Subscription School was saved and moved from a farm nearBecky's Creek in a joint project with the Randolph County Retired School Personnel, andhouses an extensive collection of one-room school memorabilia. It is open by appointmentor during special events, including Beverly Heritage Day. The Subscription School is on the right, and the restored Stalnaker house is at left. Both can be toured by appointment with the Historical Society, and are open and often staffed by historical interpreters on special occasions. 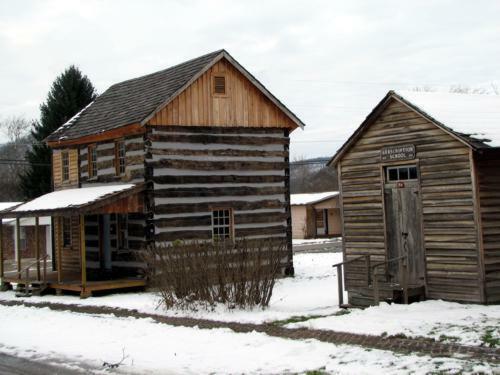 The Jacob Stalnaker Cabin was saved and moved from its originallocation south of Beverly as a joint project of the RCHS and the Stalnaker FamilyAssociation. Restoration work on the cabin will be ongoing, and both donationsand volunteer help are urgently needed! !